In early April of 1981, I had just completed Navy boot camp in San Diego, and was waiting for my first tech school to commence. After a couple of weeks, I got fed up with waiting for buses to get around, and with being confined to watching the city go by on the same old bus routes. I wanted to explore! I decided to get a one-way flight back to Boise one Friday night, and ride my motorbike back to San Diego over the weekend. It wasn't a bad plan on the surface. I stepped off the airplane in Boise late on Friday, quickly got hold of all my high school friends and partied and drank all night. The next morning I awoke early with a hangover and the realization that I probably ought to get right on the road. 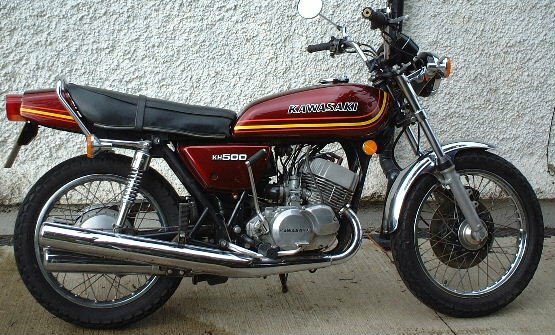 So I went to the shed and (right before starting on a 1100 mile trip) briefly checked out my baby - a 1976 KH500 - a bike I still have. I made it to the Idaho-Utah border when the first problem cropped up. I was making one of numerous stops for gas on that trip. Two-stroke mileage being what it is, I had to refuel about every 100 miles. I had stopped for gas at an off-ramp leading to a tiny town called Snowville, Utah. This is a little freeway overpass with a gas station in the middle of nowhere. I was about to hit the on ramp when I heard a funny noise from the chain. One link had broken on one side. I clearly wasn’t going to get far with one link about to fail, so rather than attempting to make it to the next town, I returned to the gas station. I got all the way through the Salt Lake City metro area, which was not very metro back in those days. By then it was getting dark, and I was getting tired and cold. I stopped and picked up a plastic rain suit to help cut the wind. When I was exhausted, I stopped in the town of Nephi for the night. I’d ridden 420 miles on a buzzy two-stroke, with an open-face helmet – I was pretty battered. I took a long hot bath and crashed. The next morning I awoke, and my bike was covered with ice. I wasn’t too happy about that, but I didn’t have much choice but to continue. It was early Sunday, and I had to report to my first technical school class at 0700 on Monday. So I hit the road, wearing my sneakers, Levi Jacket, and the green plastic rain jacket. The sky over the intermountain west during the winter months is a continuous slate-gray. That lasts pretty much from October to March. It’s also cold, so nothing is green either. Gray everywhere, all winter long… unless it snows. It's as gloomy as Seattle, but without the green. Well it was April, and I was climbing (unknown to me) a grade up onto the Colorado Plateau. The sky got darker and darker, and suddenly it was raining. Shortly after that, it was snowing. Fortunately (I suppose) it was a wet, slushy springtime snow storm, rather than a bitter frostbite-inducing cold. Still, the front tire was throwing slush up onto my sneakers. I had to stop at every off-ramp, use the hot-water tap in a restroom to warm my fingers, and get several cups of coffee to warm up my core. I was shivering from the cold, and shaking from the caffeine, and I *couldn’t* stop going, or I’d be AWOL. Finally I reached the point where I simply couldn’t go on. I reached Parowan UT, 150 miles from my starting point of the day, traveling through a blizzard. I stopped in a café - dejected, cold, and beaten. At that low point I noticed a large moving van outside. I waited for the owner to return to it, and quickly asked him which way he was going. He said he was going to Los Angeles! I asked if I could ride with him to LA, and he said that he was empty and that I could! We moved my bike onto the hydraulic lift, rolled it in, and tied it down Away we went. I collapsed on a pile of moving blankets and slept under one of them. When I awoke, the van was off the Colorado Plateau, and the driver had stopped at a rest area outside of Mesquite, NV. We hadn’t made very good time getting out of Utah - I think he was going all of 45 mph. I was getting *very* worried about my AWOL deadline, so I parted company with the van driver. I rolled into Las Vegas at sundown, about 340 miles from my starting point for the day. I was a little concerned about getting across the long stretches of desert at night with my lousy mileage and small gas tank, so I bought a 1 gal gas tank and strapped it onto the back seat of my bike. And away I went into the night, across (unknown to me) the Mojave Desert. 330 miles to go in 9 hours. No sweat... or so I thought. And so I set out yet again. It kept getting colder and colder and colder. No precipitation this time (it’s a desert, after all), just clear icy zero-humidity wind - like on Lake Superior when it’s frozen over. So once again I was freezing and stopping all night long. My plastic slicker was in tatters from the wind and cold, so I’d bought a roll of duct tape to stick it together where the creases had torn. It wasn’t very pretty, and it was *very* noisy flapping around in the wind. I stopped in Barstow for a 3:00 breakfast and warm-up. I dropped down off the high desert and it wasn't quite as frigid. The temperature situation improved to cold, humid and clammy as I lost altitude and approached the ocean climate. I stopped in San Bernardino for my final fuel stop… and all the electrical on my bike went dead! The engine still ran, but the headlight, taillight, etc didn’t work! I was in a panic! Here I was, two hours from San Diego, and I couldn’t ride through the dark to get there! I tore the bike apart. I checked fuses, and wiggled wires, and went into the headlight casing (where most of the wiring connections are made). I begged a couple of guys who were hanging out to give me a ride to San Diego for all my remaining cash - $50 – but they refused… In retrospect, they were in a low-rider at 4:30 AM hanging out, and probably involved in drugs, hahaha. But I was a rube from Idaho, and didn’t know a thing about that sort of thing. Eventually though, as I moved the handlebar, and the lights on flickered briefly. AHA! The main wire from the battery to all the accessories had kinked between the frame and the fork over the years, and had finally broken. The service station attendant gave me a connector, and voila! Everything worked again. But I’d lost an hour. I had an hour and a half to go more than 100 miles, finding my way to the base in an unfamiliar city. So I drove 80-100 mph from San Bernardino to San Diego, in the dark. There was a section of interstate that at that time had not been completed, so the road went down to two-lanes winding through the hills. I didn't bother to slow down on the unfamiliar road. I flew past a border patrol station near Escondido before realizing what it even was... I could tell there were patrol cars there, but not what kind of law enforcement each one was. They flashed by too quickly for me to see if they were cops. I got to the outskirts of San Diego and it began warming up as the sun began to rise. The Monday morning commuters were staring at me, so I briefly stopped and ditched the duct-taped plastic rain suit. I made it to the base without any detours, parked my bike outside the gate (because of course it wasn’t yet registered to enter), and dashed to my room. The training class required a different uniform than the one I'd worn throughout boot camp, so I hurriedly put one on for the very first time. I arrived at class 5 minutes before 0700 hrs - and they had a personnel inspection :( Which I failed miserably. I hadn’t shaved, my uniform was wrinkled, had dangling threads remaining from manufacture, and my shoes were dirty. So I had to muster for a re-inspection the following Saturday :( I could barely stay awake during class as well.